Valentine's Baking: Conversation Heart Cookies ~ Learn, Live, and Explore! Decorating cookies is an artform. It really takes a steady hand and an eye to make things look good. And I am still trying my best to practice so that one day I will be as good as my mom (see past cookie posts here and here) or others I admire - check out Bake at 350 and Sugar Belle for decorating masters. 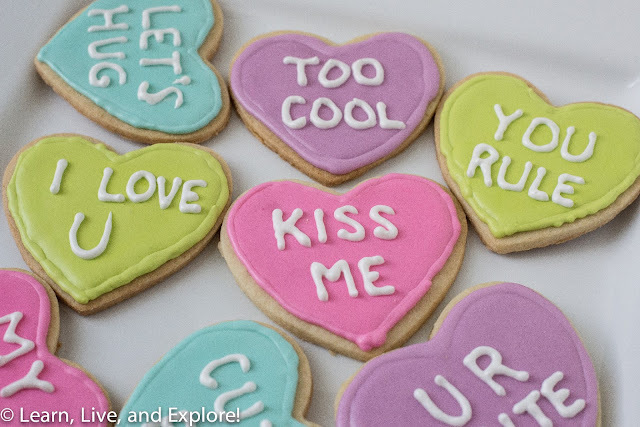 I decided that for Valentine's Day, I would whip up a batch of my mom's butter cookie recipe that is perfect for cutting shape cookies and some royal icing in order to make conversation heart cookies. There are tons of recipes out there for both, and no one is necessarily better than the other. For the cookie dough, the key is to chill the dough long enough - you can even chill it overnight. Just make sure to separate the dough so you can roll it out between two pieces of parchment paper and then stack all the rolled out dough on a cookie sheet to chill, wrapped in saran wrap so it won't dry out. Decorating cookies is a multi-day process in many cases. For these cookies, I made the dough Friday night, baked the cookies Saturday morning, outlined and flooded the cookies Saturday afternoon, then piped the letters on Sunday morning. It really takes a day for a flooded cookie to dry properly so that it is not susceptible to caving in on touch. While the outline and flooding is not perfect, I'm really happy with how well these turned out! 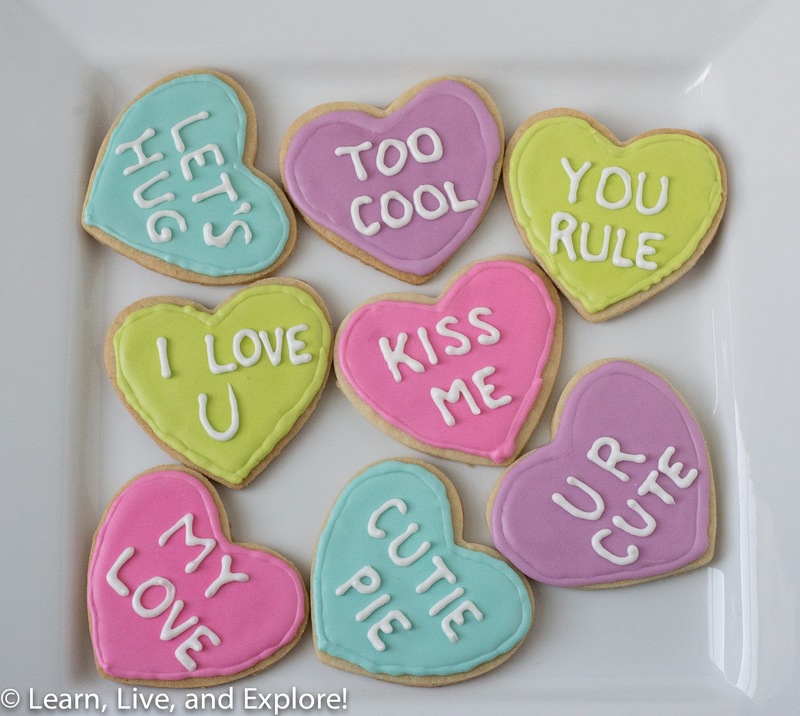 And what a super cute Valentine's Day present for your special someone!